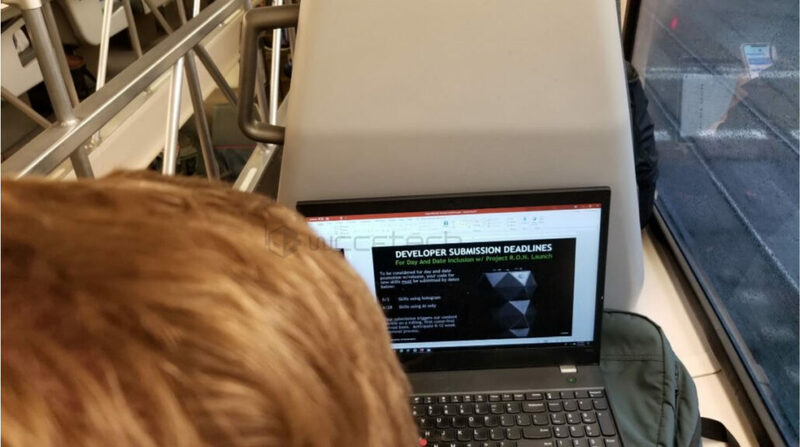 A slide spotted recently on the Caltrain shows an upcoming NVIDIA Project R.O.N. This post and all materials contained inside are part of our annual April Fools joke. We got a tip-off from one of our friends who spotted something pretty interesting on the Caltrain this Monday. 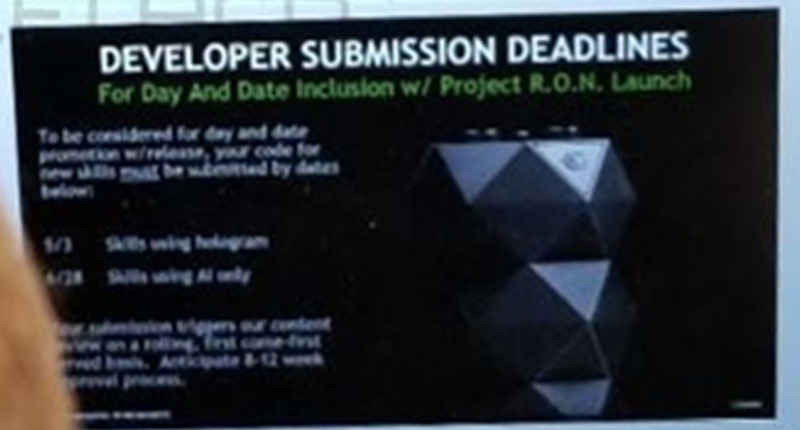 Looks like NVIDIA is entering the smart home device business with a venture called Project R.O.N. From the looks of it, it will feature its own AI-based assistant as well as something called Hologram. The picture was taken from behind an unsuspecting NVIDIA guy (who had an NV badge on him at the moment) working on his laptop on the Caltrain headed to San Mateo. The picture shows him working on a slide with “Project R.O.N”. This is obviously not a project the company has announced as of yet, but from the blurry details that we can read from the slide, this is some sort of Google Home/Amazon Alexa type device. The dev portions mention skills related to both the AI and hologram segments. The AI part is something the company should have absolutely no problem with considering its expertise in this particular field so the hologram is what actually piqued my interest. No one has of yet managed to make a real, portable hologram, and I very much doubt NVIDIA can change that (its a problem of how physics work – not innovation). But considering I can see a fairly bulky device, I am assuming they have some really cool 3D projection mapping tech in there – which is the next best thing to holograms of science fiction. A full 3D-scanned projection mapping tech on a home device would work absolute wonders. If there is an intelligent input system as well through a sensor system, this can be game-changing. A smart device that displays the output of your questions or creates interactive surfaces on everyday household items would quickly disrupt the smart home market. I also have a feeling the word R.O.N has something to do with ‘Radio Asp. Folly’ software framework that I heard about from NVIDIA almost a year back. The details are hazy in my mind but from what I recall, it had something to do with interactive smart home devices linking up to games to improve immersion. Looks like they finally finished it. Here’s the thing though. Smart home devices are usually pretty compact – this one is not. In fact, it is at least three stacks of a standard google home mini in a body that could easily fit a small NUC-esque setup. This is why I have the suspicion that we might be seeing some Tensor cores thrown in somewhere – for NVIDIA to really drive in the edge of its Turing architecture. Considering the slide shows developer submission guidelines, this should be seeded to select press under NDA shortly and I am sure we will begin seeing more leaks on this very soon. So stay tuned!